Norway may be best revered in metal circles for its blackened contributions during the 1990’s explosion, but there has always been a healthy domestic output in other sub-genres. 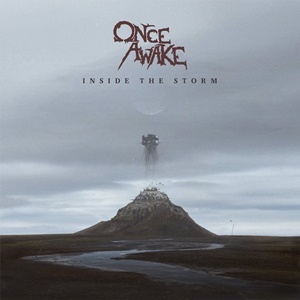 Once Awake from Bergen mix up groove metal with thrash, death, and catchy/technical overtones – arriving at a potent musical cocktail present on their second album Inside the Storm. The quintet seems uninhibited by any confines for their influences- synthesizing the best elements of decades of metal and putting a modern stamp on the proceedings. What this means for the listener is you can expect anything from a hypnotic, atmospheric passage that has a bit of electronic-enhanced sonic punch to give chase to a melodic metalcore meets say lower-tuned gritty groove metal crunch – twisting and swirling yet never losing the plot for that treasured hook. It means the progressive djent brilliance of TesseracT can careen headlong into a streamlined Crowbar meets Machine Head-ish riff and semi-rhythmic Gojira ambiance for “Deathtrap”, while singer Frodo Hennoe rips his larynx to shreds through metalcore screams against his bandmates gang-like supplementation. Or setting up certain tracks with a calmer, alternative guitar foundation before the distortion levels the playing field – “Live Life On” and “The Faded” two surefire appeasers for those that want melodic groove metal with multi-layered parts and semi-blasts to open the dynamics. The band is smart to put in those sparse alternate/clean vocals, but aren’t attempting to hit notes beyond their range – the screams and growls kicking that aggressive meter that shows Once Awake aren’t aiming for commercial superstardom. In spots you get the feeling that as much as the group loves Parkway Drive they also acknowledge affinity for In Flames – as well as some thrash pioneers like Kreator during even a mid-tempo effort like the title track, where the circular guitar line penetrates against the crushing rhythms and steady drumming. Once Awake succeeds in this ten-song effort because of the attention to songwriting construction and execution. They aren’t going for the simplest breakdown and pedestrian lyrical viewpoints – they are aware of modern production values but don’t rely on using effects when actually instrumentation and smart transitions work best. As such, Inside the Storm will probably allow Once Awake to develop a faithful fanbase because of their wide influence tree that they pull from, and should be worth your time if you dig groove metal, thrash, and melodic metalcore with a sprinkle of angular death added.